Story: The Dalton brothers are the cousins of the famous Dalton brothers. They are Joe Dalton the youngest and toughest, Jack Dalton who is a little older and not quite as tough, William Dalton who is a little older and less tough than Jack, and Avarell Dalton the oldest who is the stupid one with an enormous appetite. The Dalton brothers spend a lot of time in jail but are otherwise trying to be desperadoes in the Wild West. 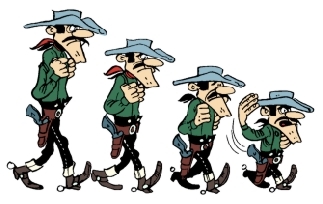 Background notes: The first time the Dalton Brothers appeared in Lucky Luke, in the story Lucky Luke contre Joss Jamon, they were only extras in the story and didn't look the way they do today. The basic idea with looking alike except for the size was there, but they didn't look like they do today. That was changed in the following story Les Cousins Dalton from 1958, where they became Lucky Luke's adversaries. The four brothers were now given the same looks as Morris had used on the real Dalton Brothers in the story Hors la loi from 1954. The famous Dalton Brothers had been killed by Lucky Luke, and their unknown and inept cousins wanted revenge. This became the first of many encounters, as both the visuals and the dynamics of the four brothers doing both rather intelligent and incredibly stupid things at the same time, made both intelligent and entertaining stories for people of all ages. The Dalton Brothers appeared along with Lucky Luke in the first Lucky Luke cartoon, Daisy Town from 1971. The cartoon was partially an original story, which was later turned into an album in 1983, and partially a mixture of several side stories from the albums (voices by Pierre Trabaud, Jacques Jouanneau, Jacques Balutin and Pierre Tornade as Joe, Jack, William and Avarell respectively). In the following cartoons, including the latest cartoon from 2007, the four brothers have appeared on a regular basis and will presumably continue to do so. When Lucky Luke was transferred to live action movies in 1991, the Dalton Brothers were there too in both movies. Joe was played by Ron Carey, Jack by Bo Greigh, William by Dominic Barto and Avarell by Fritz Sperberg. The third movie, Les Dalton from 2004, was a Dalton Brothers movie rather than a Lucky Luke movie. Here Joe was played by Eric Judor, Jack by Saïd Serrari, William by Romain Berger and Avarell by Ramzy Bedia. Several Lucky Luke games have been released over the years, the earliest record of the Dalton Brothers appearing in games so far, is Lucky Luke: The Video Game from 1996. They have appeared in at least one more game, Lucky Luke: Go West for PC, Nintendo Wii and Nintendo DS from 2007, and most likely they have appeared in other games. In terms of merchandise, only a few figurines and an activity book have been seen so far, but most likely other types of merchandise with the Dalton Brothers can be found.